When you start to type a term in the search box in a database, the databases will retrieve other related terms to your search. As you see below, when you type in "transgender" as a search term, longer, more specific search terms pop up, like "transgender children." 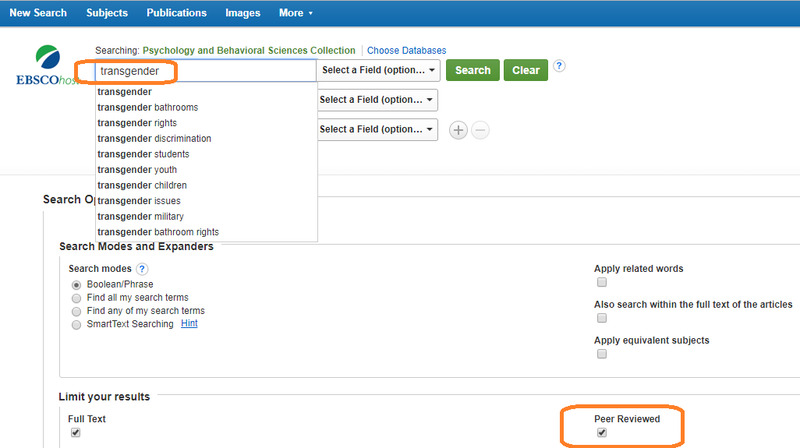 By suggesting other articles and terms included in the database, the database (in this case, the Psychology & Behavioral Sciences Collection) can help you find articles for your research. If you need "peer-reviewed" articles only - articles written by experts in the field - check the box at the bottom that says "peer-reviewed" to retrieve academic, scholarly articles. For this search, we chose a term suggested by the database, "transgender children in schools." Using limiters, as seen in the left-hand column, we can find Peer Reviewed articles published in the last ten years. Notice that "transgender children" appear as s SUBJECT term under the title of the article, which lets you know before reading the article that it is pertinent to your research. At the bottom of this illustration is a Limiter called "Subject." The first subject term listed is transgender people, but there are more. 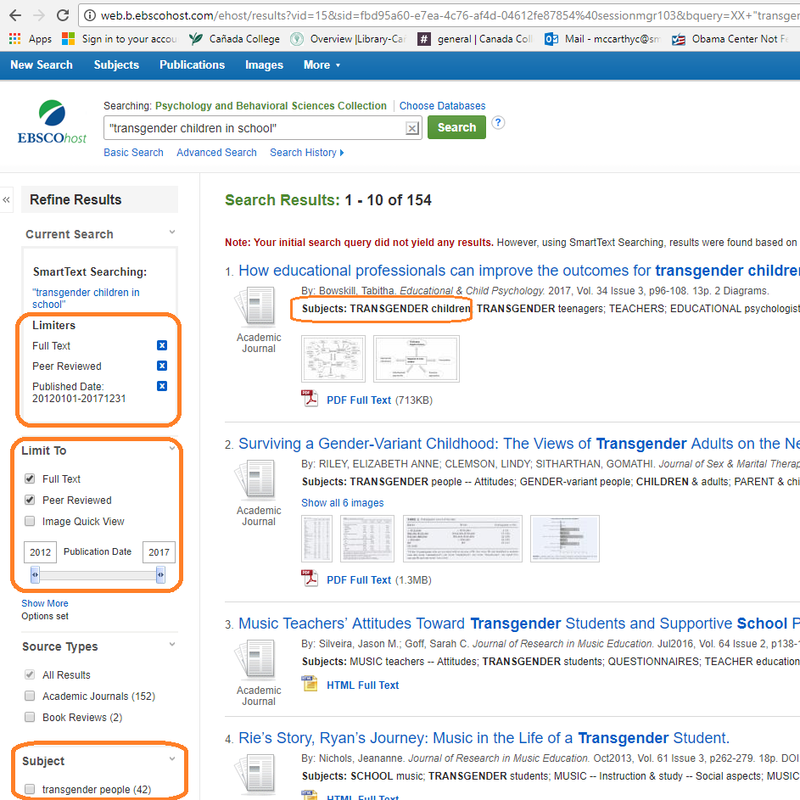 By refining your search using Limiters in the database, you can find articles about transgender children in schools. Why should you do research in academic journals? If you find one good article that supports your research, you can use the bibliography at the end of the paper to locate further research, which saves you time! What are the Features of a Scholarly Article? Take the time to watch this six minute video. It reviews the parts of a research article and will make the articles you find seem less overwhelming to read through. Learn more at Library Databases.